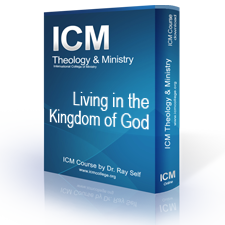 This course covers many aspects of the Kingdom of God and gives a practical understanding of what it means to be a part of that Kingdom. The word “Kingdom” is referred to 126 times in the Gospels which obviously makes this an important study for all believers. This eight-lesson course is an International College of Ministry course for all ICM students, as well as any person interested in scientific discoveries from a biblical world-view. Science has grown by leaps and bounds over the past fifty years and with all those advances came an unexpected complication. Instead of proving the world’s generally accepted theory of evolution, science discovered evidence that can only be explained by design – intelligent design. This course explores creation through science in light of God's Word which tells us creation is self-evident and all are without excuse for not seeing it. This special 8-lesson course is built around a series of video documentaries that explores God’s creation through science. Each week we will combine a video presentation along with in-class discussion. This nine-lesson course was recorded by ICM Dean of Theology, Dr. Barry E. Slimm and is an in-depth study of the final eight chapters of Romans. The book of Romans reveals the answers to important questions and supplies information on many topics, such as salvation, the sovereignty of God, judgment, spiritual growth, and the righteousness of God. Many scholars also describe it as The Gospel and the Righteousness of God, which can be received only by faith in the atoning death of Jesus Christ. This eight-lesson course was recorded by ICM Dean of Theology, Dr. Barry E. Slimm and is an in-depth study of the first seven chapters of Romans. This is a fun and very informative live interactive course teaching you how to hear God's voice clearly and then become His voice for your family, your community, your church, and perhaps our nation. Jesus said very plainly. "My sheep hear My voice, and I know them, and they follow Me; (John 10:27). This is what this course will be about. Each student will learn how to recognize the voice of God in a very clear manner and receive His personal instructions. Every student will learn what God expects in response or how to do our part with what God is speaking to us. The Bible gives us strong mandates concerning obedience and listening to our Lord. This course will sharpen your ear and give you a new boldness to become a powerful supernatural ambassador for God.